This chapter just has to be titled "The Gulliver Effect". Up to this point my "Chapters" have been based on detailing the R.O.W. and other scenic elements. This one may seem a little different but, it's really not. 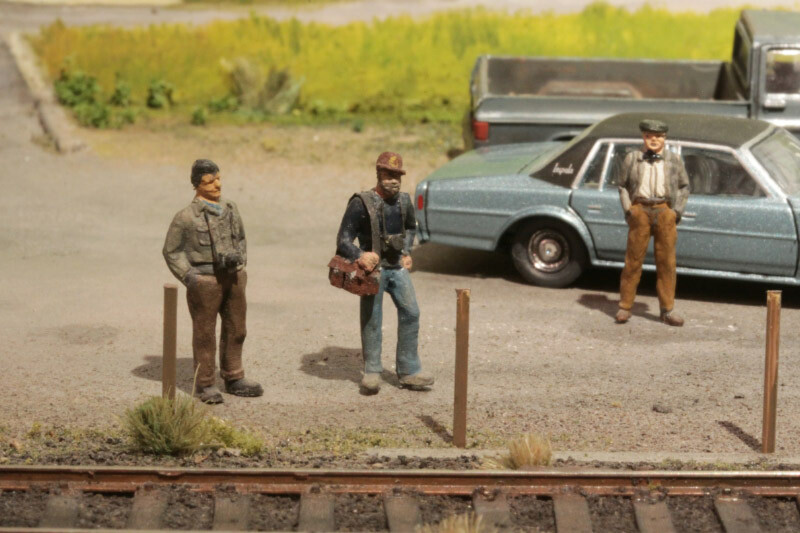 On our layouts the people are actually just scenery. They're inanimate unlike our trains and mute unlike the sound systems most have. Gotta have people though and to make them look like they actually represent someone and are doing something, well why not? Making them unique to our layouts, even better. You guys are all top shelf modelers it should be easy. Get out the Optivisor, #11 XActo and filler. Oh yea, tweezers and imagination. 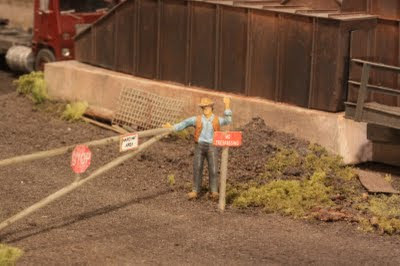 I admit to developing some imagination for this and skill in the use of the tools and materials as long ago as the 70's. I had quite a long lasting adventure building up Historex kits in 54mm to represent all the regiments of French cavalry during the Napoleonic era. This amounted to over 100 figures that came at "Present Arms" and needed animation into more interesting and realistic poses. You do know the advantages of checking out other modeling areas like the automobile, aircraft, ship and military venues? 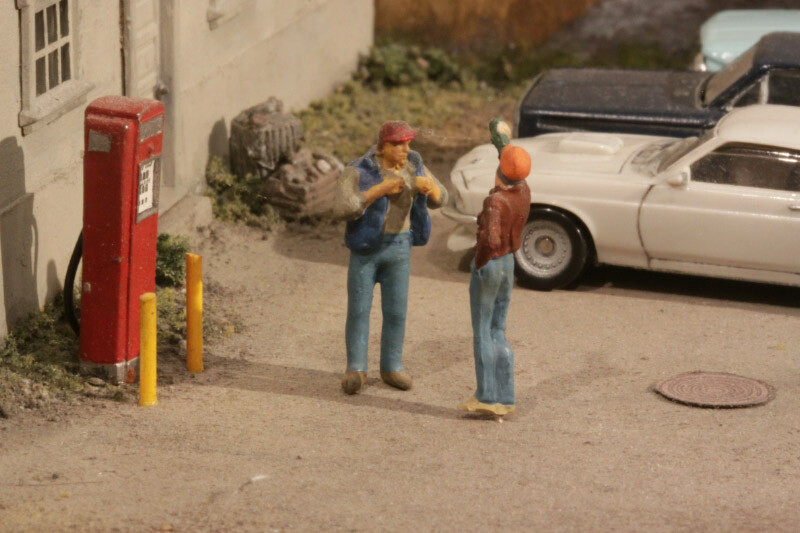 These figures represent Me with railfan companions of the 80's Doug Lezette and Bob Dennis. I had to make the cameras and camera bags, change the position of the arms bit. Rob on his bike is straight Preiser. Me in my typical Levi's, CPO jacket, O&W cap, Al wearing his gray jacket and brown pants and my Dad with his driver's cap and Mal Houck bow tie. See 1834 re. cameras etc. My Father-in-law who worked as a dispatcher for Lehigh Cement in Cementon. Remove the original brim hat and in it's place add a hard hat made from epoxy resin cast in a clay press mold and reposition a reaching arm. 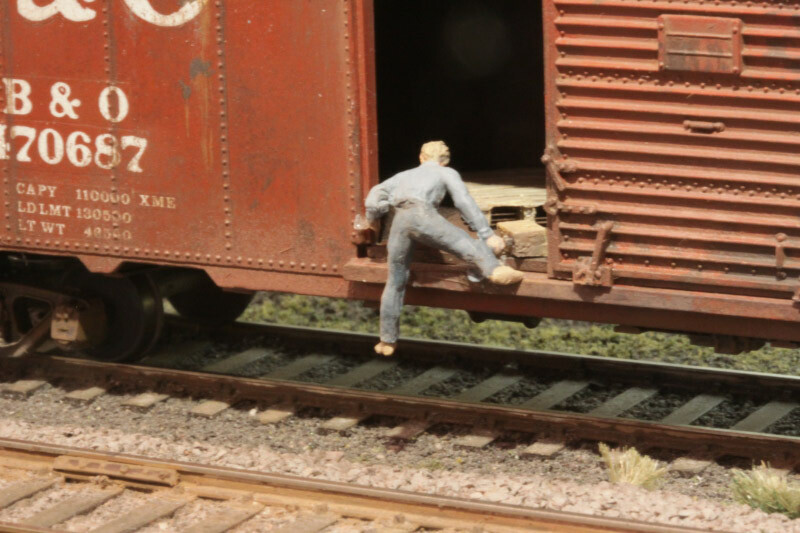 "Hobo catching out" This pose was inspired by a photo Jeff Brouws shared in a NRHS Bulletin article. The original was taken in the 60's by Michael Mathers. There was a lot of arm and leg repositioning in addition to bending the upper body forward by slicing a chunk out of the abdomen. I gave him a blanket roll and wicker valise too. Adjusting a side view mirror accomplished by extending the reaching arm. "Break time at the cement plant" No Mods, just grouping figures appropriately.